In the early morning of June 12, 2011 we AlunAlun Dance Circle members excitedly assembled for our first-ever visit to Batangas City. We had no idea what to expect from the kind invitation extended to us by the Batangas City Cultural Committee through its leading member, Atty. Tony Pastor, except that our performance would be the main event for their Independence Day celebration. A bit of suspense had pervaded our rehearsals, though. A few days before the date, heavy rains pummeled Batangas City and brought floods. It was typhoon season after all! The planned venue, an open air ampitheatre in the city center, was unusable, and city officials were preoccupied with helping the evacuees. But Tony Pastor and his group were determined to have a meaningful Independence Day program, so, troopers all, we were going on with show! Into our hired van we piled in with our bagsful of costumes and simple props, Reggie’s portable kulintangan, and rolls of linoleum in case we needed to cover some rough surfaces. The dancers were Ligaya, Nannette, Punch, Temay, Joy, Rama, Mannex, Gimo, and myself, plus six-year-old Roni in only her second performance with the group, and, by a great stroke of luck, Peter Paul de Guzman, who is here for a few months from Los Angeles. Upon our arrival, the first thing we did was check on the alternative venue, a huge covered court surrounded by various government offices. Nini, our technical person, quickly touched based with the sounds people. A local organization conducting a day of fun and games for families was requested to end their program early so that we could do our blocking. We took stock of the bare cement stage, the absence of dressing rooms, the cavernous structure…and prepared ourselves to make do. We were confident we had rich cultural fare to offer the people of Batangas City, and we were happy to do it even in the humblest public facility. We had our first inkling of the kind of Batangueno hospitality that was in store for us, when Tony Pastor warmly ushered us into the elegant Pastor-Acosta ancestral home. Built in the 1900’s by Tony’s parents, and devotedly and superbly preserved by Tony, its every exquisite detail thrilled us city folks, so thirsty for connections with our authentic Pinoy soul. Kapiyas, mesa altars, four-poster beds, santos, family portraits, lacy curtains and gilt-framed mirrors completed this scene of provincial urbanidad. Proudly standing as centerpiece in the airy living room was a gleaming Bosendorfer piano that was Tony Pastor’s prized possession and dearest toy. Lunch was served! “A simple Batangueno lunch,” Tony Pastor modestly described it, prepared and served by a bevy of staff, obviously well-trained for frequent gatherings, the Pastor-Acosta home being in effect a mini-cultural center. A stand-out was the pork adobo, Pastor family style, which was shorn of fat and tinted with achuete. But lest you think you are saved from cholesterol, the skin and fat have been cut up into cubes and cooked to crispy goodness into homemade chicharon. Yummm! Soon we had to tear ourselves away from the leche flan and rest a bit before getting ready for the show. We thought we would have enough time for a technical rehearsal (some of us missing the tamales that were served for merienda), but we realized we would only be able to do re-blocking on stage. Several numbers had to be re-oriented to a proscenium-type set-up instead of in-the-round. Ligaya and Nanette figured out adjustments to cater to the audience’s line of sight which our studio rehearsals could not take into consideration. I marvelled at everybody’s gung-ho spirit and flawless teamwork. Each one found a place somewhere at the back of the stage to park his or her stuff for speedy costume and props changes. The younger ones helped the senior dancers remember which was which. No one was fazed by the limitations of the situation, the humid atmosphere and the vicious mosquitoes buzzing about. The Cultural Committee thoughtfully pointed out to us a comfort room inside one of the air-conditioned offices that we could run to for our basic needs. People started trickling in and soon all the 500 or so seats were taken. It was satisfying to see that our audience were the ordinary townsfolk, aside from the handful of VIP’s that were seated up front. A sense of expectation filled the air, quieting to a hush as the master of ceremonies introduced us. 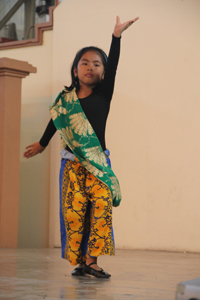 We felt the usual nervousness even as little Roni made her self-confident entrance for “Ano ang Pangalay?”. As each number was met with warm applause, we became more relaxed, but the fast pace of the program, with necessary costume or prop changes, was still challenging. From behind the stage I occasionally peeped to check how receptive the audience was, and I saw Tony Pastor seated in front, his whole body alert and attentive to all the goings on. He was visibly delighted, and especially amused with the surprise number Ligaya had prepared for him– a playful choreography depicting luksong tinik and tug-of-war to the music of Sonata in C Major by Mozart, as rendered by Tony in a CD recording he had given me. This, and other energetic numbers like tawti were possible because for the first time we had four strong male dancers in the group. ” Pag-ibig sa Tinubuang Lupa”, a dramatic tableau choreographed by Ligaya to Bonifacio’s poem (powerfully sung in the Inang Laya CD by Becky Abraham), also maximized the presence of the four “boys” symbolizing the various sectors that make up Philippine society. Given the good sequencing and diversity of numbers, the audience was one with us, from the poignant melody of “Ugoy ng Duyan” as danced by Nannette, to the vibrant folk tune of “Sa Kabukiran,” and finally the rock hit song “Bonggahan”. Ligaya’s boogie moves to Sampaguita’s popular classic never fails to evoke the fun-lover in every Pinoy, bringing the program to a rousing close. Our open forum, a standard feature of our presentations, as usual brought several good questions to the fore, giving us our wished-for opportunity to enlighten more people about pangalay. And coming from the revered tradition of Batangas’ own subli, our audience was not at all shy about trying out pangalay movements when invited to do so. Back at the Pastor-Acosta home, we had our reward of another sumptuous dinner prepared byTony’s kitchen staff. Over dinner we had a lively exchange of cultural views with members of the Batangas City Cultural Committee and other culturally-minded citizens of Batangas City. After dinner jamming began with piano playing and singing by our host, with a live reprise of Sonata in C major, the better to show some of the playful moves. We also discovered some similarities between subli and pangalay–two sacred dances, coming from different ancient spiritual traditions, each finding expression in the Filipino psyche. With regrets we had to start off for Manila–but not before promising to return for the subli festival on July 25. And that is another story.